We've been offering marketing services and writing promotional newsletters for healthcare professionals since 1988 and have created newsletters for well over a thousand massage practices throughout the United States and Canada (as well as practices in the United Kingdom, South Africa, Australia and New Zealand). 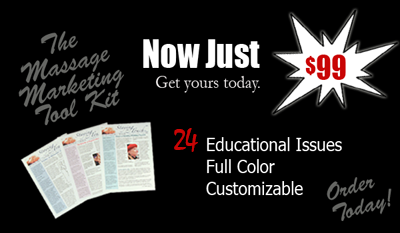 After nearly 10 years of creating custom marketing materials for over 500 doctors, Jon launched Massage Marketing in 1997. To further his knowledge and better understand the personal needs of his clients he graduated from massage school at the Humanities Center in Florida in 1999. As online marketing became necessary in today's marketplace, Massage Marketing added professional websites, client e-newsletter services, and other online marketing tools in 2003. Yari Giordanengo joined Massage Marketing as our Internet and computer expert in 2004 and handles all of your online marketing needs. Most massage schools focus their efforts on teaching massage and only allot a small amount of time for business training. Consequently, most therapists have limited knowledge on how to market their services. Our purpose is to be your simple, one-stop marketing solution, providing you with proven, effective marketing tools you'll need for your practice. We can help you present a professional image for your practice and free you to focus on delivering your services. As one of the original key marketing companies in the massage and bodywork field, our main objective is to help your practice grow. We want to develop a personal relationship with you, find out what you really need, and provide it to you. We look forward to sharing our knowledge with you, and invite you to visit our Massage Marketing Tools page to find out about our services, or contact us directlly. We look forward to hearing from you! Now you can subscribe to our monthly print newsletter service for just $10 per month! Get a new client education newsletter each month sent via email. Click here to learn more. The best marketing deal going! Subscribe to our monthly client E-Newsletter service for $25 a month! No limit on the number of client email addresses! Get more info by clicking here.